As the name suggests, dwarf French Bean 'Speedy' is one of the earliest and quickest beans to produce pods to pick. This productive variety produces good yields of slim, round mid-green pods, approximately 14cm (6in) long from July onwards that have an excellent flavour. The plants have resistance to to BCMV, Colleotrichum lindemuthianum and Pseudomonas and grow to a height of around 45cm (18in) and a spread of 30cm (12in). Speedy is especially suited to late sowings. They can be sown indoors from mid April for transplanting later on, or can be sown directly where they are to grow once the soil as warmed from late May to July. They are ideal for growing in patio containers or the vegetable plot. Harvest in 60 days, June to October. For vegetable growers, who find themselves with gaps after harvesting potatoes etc, this is the fastest maturing dwarf bean to plant. It can be planted between May and July inclusive, and will produce slender green beans within ten weeks. A dozen or so seeds planted every few days is the best method for creating a succession. Speedy give superb yields for a small amount of space, it is an excellent variety to grow in containers and performs well even in less favourable conditions. It has an excellent plant habit; the pods are carried high on the plants clear of the soil which makes picking very easy. 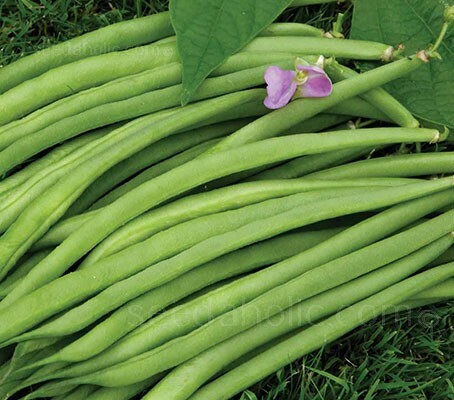 French beans, or les haricot verts as the French call them are very easy to grow and give superb yields for a small amount of space, outlay and effort. Like their climbing cousins, they are also self fertile, making them ideal for growing under cover early or late in the season. You can usually be eating Dwarf French beans 12 weeks after sowing the seeds. Only growing to about 45 cm (18in) they do not get blown over by wind and should not need staking, but you may wish to put a few sticks by their side for support if it is very windy. Dwarf French Beans are one of the most popular garden vegetables, flavoursome and versatile in cookery, and they are very easy to grow. They need no thinning, transplanting or training as other vegetables do. They are quick to give results, they are very prolific, and freeze very well. To enjoy at their best, pick when young and tender, they require only a brief cooking time and are best steamed and served whole. If the pods are left to mature on the plant they can be dried and shelled as haricot beans for winter use. Beans prefer to grow in moist, fertile soil in a sunny, sheltered spot away from strong winds. Prepare the soil for planting by digging over and adding plenty of organic material, this will help to improve the soil's moisture-retaining ability and fertility. Beans can also be grown in pots. Choose pots at least 45cm (18in) in diameter and make sure there are plenty of drainage holes. Fill with a mixture of equal parts loam-based compost and loam-free compost. Sowing: Sow indoors late April and May, outdoors in late May to July. Sowing seeds early indoors gives a faster and more reliable germination rate. Beans sown directly outside often germinate poorly or get attacked by slugs. Avoid problems by sowing seeds in late April and May in pots or root trainers in the greenhouse. Robust young plants will be ready to plant outside within about 5 weeks, growing away far quicker than outdoor sowings. Sow a single bean seed, 4cm (1.5in) deep, in root trainers or into a 7.5cm (3in) pot filled with multipurpose compost. Water well, label and place on a sunny windowsill to germinate. Seedlings will be ready to plant out after about three weeks. Before planting, put in a cold frame to acclimatise. Alternatively, beans can be sown directly in the soil between the second half of May and the middle of July. Plant two seeds next to your support about 5cm (2in) deep. Water well. After germination remove the smaller and less robust of the two young plants. As they grow, ensure the plants continue to twine around their canes. Having shallow roots regular and plentiful watering is vital. Beans should be watered particularly heavily, twice a week in dry weather, both when the flower buds appear and once they're open. Mulch when conditions are dry. Don’t hoe around bean plants too deeply or you may damage the roots. Ready to pick in just 60 days. The more you pick, the more they produce. Most should bear pods from late July and cropping of all types can continue until the first frosts, or longer if plants are protected. When boiled, don’t be too disappointed if the pods lose some of that beautiful purple colour, as they tend to turn to a deep green. The French bean is a must for anyone growing their own vegetables. For a start it’s very easy to grow, and secondly its packed with goodness, particularly protein and vitamins A and C. This goes some way to explaining their enduring popularity: broad beans have been a food crop that has been grown for over 8000 years. In a sheltered spot away from strong winds. Sow indoors late April and May, outdoors in late May to July. Most should bear pods from late July to first frosts.